Only by crossing cultures and collaborating beyond disciplines can we solve the great challenges of our time. If you look at any major company today, it’s impossible to miss the positive impact of collaboration. Technological advances and international travel have enabled companies to benefit from access to new ideas and perspectives. Bringing people together from diverse backgrounds, often across borders, has led to new ways of thinking, better solutions and faster progress. The same is true in science. When we think about some of the greatest achievements in the last century, these were often the result of hundreds of people working together across the globe. Initiatives like the International Space Station, one of the most ambitious political and scientific collaborations ever, or the Human Genome Project, the combined effort of thousands of scientists and 18 countries to sequence the DNA of the human genome. A group of Nobel Prize winners recently highlighted that without collaboration they may never have won their individual accolades. Collaboration and international mobility make science stronger. Countries with mobile scientific workforces produce more highly cited papers. Researchers who work in more than one country have 40% higher average citation rates, while internationally collaborative papers have greater impact than domestic papers. Science is increasingly global. In 1981, only 5% of research publications had overseas co-authors, compared with almost half today. Researchers also build strong links between nations as they travel, with scientists retaining ties in the countries they leave. It’s this type of collaboration that is needed to tackle the biggest problems facing society, such as developing clean and sustainable energy, combatting epidemics or providing sufficient food for a growing population. It’s only by crossing cultures and collaborating beyond disciplines that we’ll be able to solve the great challenges of our time. But world events are threatening the environments within which collaboration thrives, creating an unclear future for researchers around the world. Occurrences such as Brexit, the US’s proposed travel ban on eight countries and a rise in nationalism in many countries has created a fragile and uncertain environment for science. 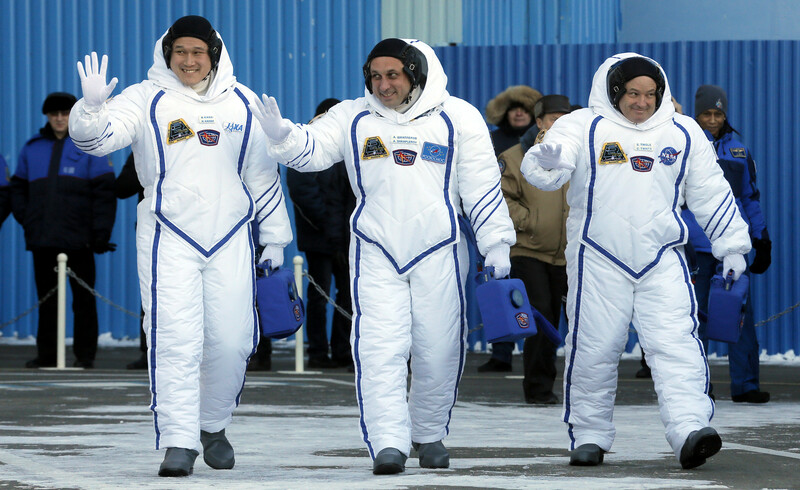 Norishige Kanai of the Japan Aerospace Exploration Agency, Roscosmos cosmonaut Anton Shkaplerov and NASA astronaut Scott Tingle during a send-off ceremony to the ISS in December. The attitudes and actions of governments shape research culture. If countries turn inwards and lose sight of the vital importance of international collaboration, this will have damaging consequences for science and the world around us. That’s why Wellcome, with other organizations across the world, has started Together Science Can, a global campaign to unite researchers and institutes in order to protect vital international collaboration. We’ve joined together with some of the greatest scientific institutions in the world, from the Max Planck Society to the African Academy of Sciences to the Bill and Melinda Gates Foundation, to support building these bridges. The world is changing at an unprecedented rate. We’re facing huge challenges – climate change, demographic shifts and the spread of drug-resistant infections, to name a few – but they are not insurmountable. Together, we can make discoveries that will further our knowledge and improve our lives in ways we cannot imagine today. In these volatile times, it’s vital that the case is made for the policies and principles that make international collaboration possible – by scientists, researchers and the public. We hope that Together Science Can provides a way for them to tell their stories and ensure they have a voice when decisions are made about how they should work together.